Winds twist daredevil Felix Baumgartner's huge balloon on Oct. 9, 2012, just seconds before his supersonic skydive attempt that day was called off. An Austrian daredevil aims to leap from the stratosphere Sunday (Oct. 14) in a supersonic plunge that would break the world record for the highest-ever skydive — a benchmark that has lasted more than half a century. Veteran skydiver Felix Baumgartner had hoped to have the nearly 23-mile-high (37 kilometers) jump under his belt by now, but strong winds thwarted attempts on both Monday and Tuesday (Oct. 8 and 9). On Sunday, however, winds may be calm enough to allow the skydiver's towering high-altitude balloon to lift off from its staging ground in Roswell, N.M., according to officials with Baumgartner's mission, which is known as Red Bull Stratos. “I like what I see on Sunday," Red Bull Stratos meteorologist Don Day said in a statement today (Oct. 12). "It will again be a matter of what happens with the winds on the top (700-800 feet). We may still have to wait and the window will likely be open until 11 a.m. We need to be ready for launch just after sunrise [about 6:45 a.m. local time]." 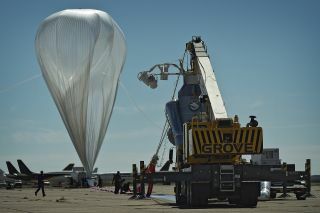 Indeed, one of the mission's balloons was rendered unusable after being whipped about by gusts on Tuesday. The weather had looked good in the morning, so the balloon was inflated and Baumgartner climbed into his custom-built 2,900-pound (1,315-kilogram) capsule. But winds kicked up to 25 mph (40 kph) briefly shortly before noon, twisting the balloon and scuttling the launch. The team has a backup balloon ready for the next attempt, officials said. If things go according to plan on Sunday, Baumgartner will ascend to about 120,000 feet (36,576 meters), then step out into the frigid void. He would thus shatter the current skydiving altitude record, which stands at 102,800 feet (31,333 m). That mark was set back in 1960 by U.S. Air Force Capt. Joe Kittinger, who now serves as a Red Bull Stratos adviser. Baumgartner should become the first skydiver to break the sound barrier as he plummets to Earth in a 5.5-minute freefall (followed by a 15-minute parachute glide to Earth), officials say. So Sunday would be an appropriate day for his leap; it's the 65th anniversary of the first-ever supersonic airplane flight, flown by American test pilot Chuck Yeager. Baumgartner will also likely set marks for longest-duration freefall and highest manned balloon flight. But the mission isn't all about breaking records, Red Bull Stratos officials say. It has scientific value as well, collecting data that could help enable high-altitude escapes from spacecraft. Red Bull Stratos has called the mission a leap from the "edge of space." But space is generally considered to begin at an altitude of 62 miles (100 km; about 327,000 feet).